Over the last few years the concept of heading to Tofino for a vacation by the sea has evolved in many ways. Tofino is no longer just seen as a place to enjoy the warm sunny days of summer but as an exciting and vibrant place to witness and enjoy the ocean through all the seasons. Kayaking and Surfing have both grown as adventure tourism activities on the water, and so has the enjoyment of viewing Tofino's spectacular winter storms. The storm season generally starts in November and carries through till the late stages of spring, but the most intense period lasts from December through February. Catching a big one takes a bit of luck, but if you keep up to date with developing storm systems swirling through the offshore waters you can increase your chances. These powerful storms are created by deep low pressure systems that move up into the Gulf of Alaska, generating storm fronts that spin off hitting the coast armed with hurricane force winds, torrential rain and massive ocean swells that can swallow up small offshore islands in a single surge. The best ways to track these developing systems is through government meteorology websites and the marine radio broadcasts. While in Tofino, tuning in to the marine radio broadcasts becomes a play-by-play commentary for the days performance. To wake up in the morning and hear "An intense front will move into the offshore waters today and cross the coast tonight. Storm warning continued. Southeast winds rising to storm force 50 knots to hurricane force 70 knots today. Seas 4 to 5 meters rising to 7 to 9 meters. Outlook: Veering to strong to gale force southerly then backing to strong to gale force southeast." gets you out of bed with the excitement of an awaiting adventure. The ways in which to enjoy a big winter storm are as varied as the people who desire to experience them. Getting all bundled up for a wet and windy walk on the beach is always a good place to start. The sensation of leaning into the howling wind and horizontal rain, as you watch the ocean being stirred up into a frenzy of white froth and spinning driftwood, is one not soon to be forgotten. For the more indulgent and comfortable of approaches, get yourself a ringside seat at one of the restaurants located along the coastline. Nothing compares to the experience of watching the surreal images of the storm outside from a warm and cozy lounge with a latte in your hands and a meal in front of you. To totally immerse yourself in the environment get accommodation in one of the many waterfront B&B's, lodges or vacation homes. This way the excitement is at your doorstep, and stunning views can be enjoyed from the comfort of a big chair and shared with a good book and a warm fire. Whatever the approach, the experience is found to be exhilarating, inspiring and relaxing, all the emotions that one feels when seeing the forces of nature that are so much bigger and more powerful than us. Located at the south end of Long Beach within the Pacific Rim National Park, this spot offers some of the largest swells and concentration of driftwood in the water. Known to be a focal point for most direction of swells, this spot gets the biggest and most powerful waves. This residential beach, dotted with B&B's gives the most varied of views. You can watch massive rollers enter the mouth of Cox Bay, towering waves crash onto Frank Island or steep breaking wave faces with the lighthouse in the background. Adam has lived half his life in Tofino, many of those years on Frank Island, where Winter storms were hard to ignore. 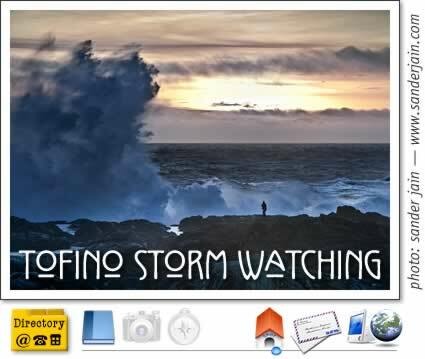 Tofino storm watching guide with the best spots to watch storms in Tofino, Ucluelet and the Pacific Rim National Park.